TED is a modular energy storage unit that accepts any kind of electricity – solar, wind, fossil fuel-generated or straight off the grid – and uses it to heat up and melt silicon in a heavily insulated chamber. Whenever that energy is required, it’s pulled out with a heat engine. A standard TED box holds 1.2 megawatt-hours of energy, with all input and output electronics on board, and fits easily into a 20-ft (6-m) container. 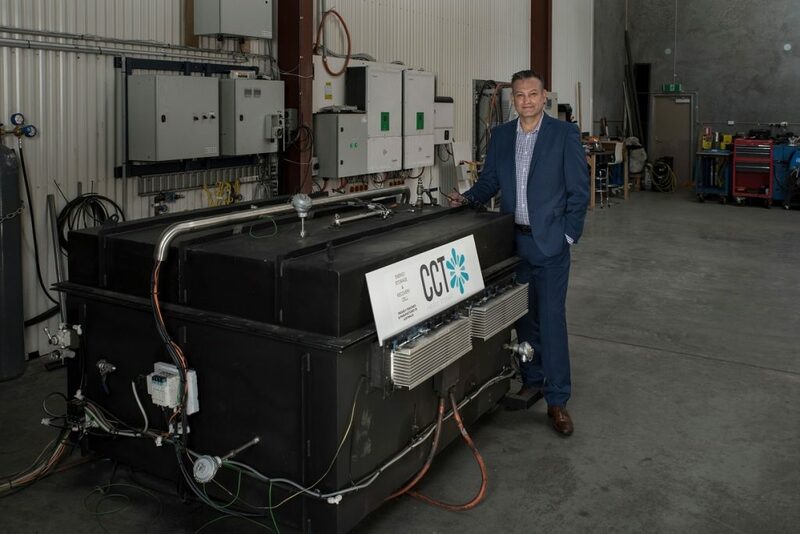 Here are some of CCT’s banner claims about the TED: For a given size volume, it can store more than 12 times more energy than a lead-acid battery, and several times more than lithium-ion solutions. Installations can scale from 5-kilowatt applications out to a virtually unlimited size. Hundreds of megawatts of instantly accessible, easily controllable power should be no problem – all you need to do is add more units, plug-and-play style. In the case of an outage, each TED device can remain active for about 48 hours. It can also charge and discharge at the same time, and there are only three moving parts per box, so maintenance is almost negligible. Where lithium-ion and other batteries degrade over time, perhaps dropping to 80 percent capacity in some 5,000 cycles or so, the TED system has shown no signs of degrading after 3,000 cycles of service on the test bench, and CCT’s CEO Serge Bondarenko tells us over the phone that the company expects its units to last at least 20 years. “Molten silicon just doesn’t degrade like lithium does,” says Bondarenko.